July 2016: President Petro Poroshenko kneels before the monument to the victims of the Volhynia tragedy. Source: President of Ukraine.In Poland and Ukraine, conflicting historical narratives have long been used and abused by political forces on both sides. While Ukraine’s Euromaidan brought some fresh air to the relations between the two countries, with Poland supporting Ukraine’s struggle on the diplomatic, political and people-to-people levels, contentious history is once again coming to the fore. This time, mainstream narratives in both countries are increasingly being influenced by far right groups. Once allies aiming to form an international nationalist movement, far right groups on both sides have returned to historical misunderstandings. The increasing tensions may have a detrimental effect on the relations between the two societies. More importantly, however, they suggest how international nationalism could fail. On 4 March, the centre of the west Ukrainian city of Lviv was full of men in military outfits and dark blue jackets bearing yellow tridents. 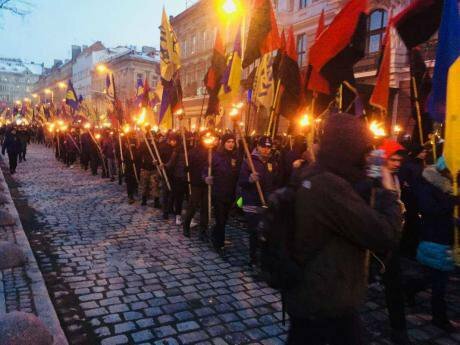 Hundreds of people carrying torches marched through the city’s streets amid flags with the emblems of the National Corps, Svoboda and Right Sector – Ukraine’s main far-right groups – as well as a large black and red flag of the Organisation of Ukrainian Nationalists (OUN). The front row was made of men hidden behind balaclavas. Their banner displayed the image of the legendary Ukrainian Insurgent Army commander, Roman Shukhevych, and a message: “The city of Lviv: No to Polish masters”. Crowds chanted “Our land – Our heroes”, and “Remember foreigner that the host here is a Ukrainian”. It was not long before a response arrived. On 19 March, Polish far-right groups organised a retaliatory picket at the Ukrainian Embassy in Warsaw. Their banners read: “Stop anti-Polonism, defend the truth”, “A Banderite is not my brother” and “Banderites are Nazis”. The rally ended with the burning of portraits of Shukhevych and Stepan Bandera, the historical leader of the Organisation of Ukrainian Nationalists. 4 March: Ukrainian far-right groups gather in Lviv to commemorate UPA commander Roman Shukhevych. Source: National Corps.This escalation of mutual animosity came after the Polish Sejm passed legislation in February proposing fines and up to three years of imprisonment for those who deny crimes committed by the OUN and UPA against Poles during the Second World War. Most notably, the law refers to a series of massacres in 1943-1944 in Volynia and eastern Galicia, which claimed the lives of around 100,000 people – a crime that Poland considers genocide. In 2015, Ukraine’s Verkhovna Rada passed a law recognising OUN and UPA as fighters for Ukraine’s independence. For the Ukrainian far right, including the National Corps – the political wing of the Azov regiment, known for its role on the Donbas frontline – Stepan Bandera and Roman Shukhevych have become role models in what they see as a continuation of Ukraine’s struggle for independence. Historical memory hasn’t always divided Polish and Ukrainian nationalists. The National Corps, which claims a membership of 10,000, has sought cooperation with Polish far right since the party’s creation in 2016. Nationalists from both countries have met at conferences organised in Ukraine and Poland, as well as attending numerous informal meetings. By March 2018, National Corps had established contacts with Polish groups Szturmowcy, Niklot, Autonomous Nationalists, Trzecia Droga (Third Way) and Roman Rybarski’s Institute. They are also relatively marginal in contrast to the large membership base and political connections of the National Radical Camp and All-Polish Youth. During the now infamous November 2017 Independence March in Warsaw, Szturmowcy were part of the Black Block, which back in November terrified the world. That day, a marching crowd of around 400 people dressed in black and balaclavas with white skulls covering their faces made for an ominous scene. Their banners displayed some of the most radical slogans present at the march: “Europe will be white or deserted”, “White Europe of brotherly nations”, “Pure blood, sober mind” – a reference to straight edge ideology. Black Bloc at the 2017 Warsaw Independence March. Image: Agnieszka Pikulicka-Wilczewska. The Black Bloc was joined by individuals from Italy, Bulgaria, Germany, Russia, Serbia, Estonia, Latvia and other countries. A representative of the National Corps was one of them. The day before, she attended a conference organised by Szturmowcy and their allies under a telling title: “Europe of the future”. 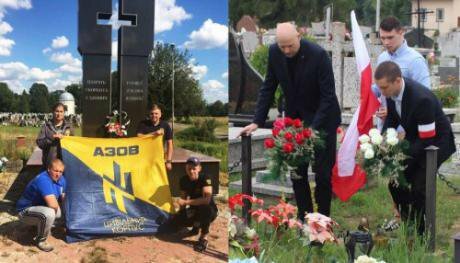 2016: Polish and Ukrainian far right groups pay their respects at the grave sites of Poles and Ukrainian killed during the events of 1943-1944. Source: Reconquista.Held in Warsaw, in a small hall full of young men and a much smaller number of women, the Europe of the Future conference before the November 2017 Independence March aimed to set the basis for the pan-European cooperation of radical nationalist forces. Speakers included representatives of the National Corps, Estonian Sinine Äratus, the Kyiv-based Russian Centre, Russian White Rex and American alt-right groups. Richard Spencer, a white supremacist from the US, was scheduled to attend, but the Polish government blocked his visit. Under the label of third way or new nationalism, this unofficial pan-European alliance of far-right groups calls for racial separatism and anti-capitalism. It also rejects “chauvinism against other whites” and all forms of imperialism, be it American, Russian or what they call cultural Marxism imposed by Brussels. As such, these groups are unequivocally anti-Putinist, although not anti-Russian, and frequently involve in violent street actions against LGBTQ and other minority groups. “Most of these groups are united by their white European nationalism, where the identitarian movement’s repackaging of the neo-fascism of the Nouvelle Droite for the internet youth plays an important mobilising role,” explains Matthew Kott from Uppsala University. “White racialism is now at least as important as purely national identity. And metapolitics and politics of the street are on the rise to undermine the ‘system’ of liberal democracy,” he added. With a rise in scepticism among far-right groups towards NATO in the wake of Crimea, both Polish and Ukrainian far-right groups found common ground in the idea of the “Intermarium”, which became the main theme of several National Corps-organised conferences. The idea was first coined by the Polish interwar strongman Józef Piłsudski. In the early 1920s, states emerging from the ashes of the First World War were looking for a way to counter the rising threat from Germany and the Soviet Union, and the Intermarium is what Poland came up with. It proposes a creation of a regional military alliance of states between the Baltic and Black seas, with Poland as its natural leader. Back in the day, the grandiose plan never materialised. Yet, the Intermarium was recently resurrected by Poland’s Law and Justice government and later adopted by the Polish and Ukrainian far right, which, as Matthew Kott explains, has seen it as an alternative to the growing impotence of NATO and “decadence” of the European Union. For far-right groups, the annexation of Crimea and outbreak of war in Ukraine’s Donbas, in particular, have demonstrated the need for an alternative regional structure. Semenyaka acknowledged the importance of Polish-Ukrainian cooperation. “It goes without saying that reconciliation between the two biggest countries of the region, Poland and Ukraine, plays a crucial role in the accomplishment of this goal, and the new nationalist solidarity is our priority and strategy.” She also added that the National Corps will not compromise their position regarding cooperation with Poland, even if this would mean the end of their year-long alliance with fellow Ukrainian far-right groups Svoboda and Right Sector – groups traditionally more skeptical towards Poland. “We plan to create a kind of free university for all activists of these movements, in order to promote this pan-European ideology, not only in the ranks of National Corps,” Semenyaka said. “You can’t expect that all of them will be sophisticated ideologically." Referring to ethno-nationalist tendencies among many sympathisers of the far right in Ukraine as “old nationalism,” she assured that educating youth on the Polish-Ukrainian issue will be high on the agenda of National Corps. Given the relative ethnic and cultural homogeneity of central and eastern Europe, according to Semenyaka, the region is uniquely positioned to create this alternative axis of European integration. “So, from Intermarium to pan-Europa and to the new dawn of the West!” she ended her speech. The conference, however, was not the first attempt to create a lasting alliance. Since 2016, the National Corps has regularly held international Intermarium conferences, attended by the Polish far right. 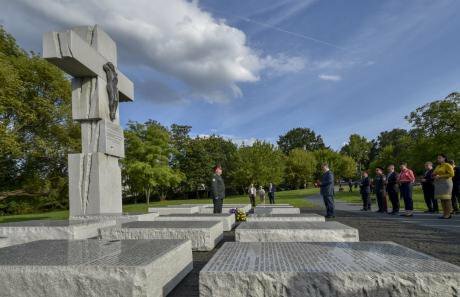 Moreover, in 2016, delegates of the National Corps and Polish nationalists laid wreaths at the graves of victims of the Volhynia massacre to commemorate the lives lost on both sides. At the same time, the article argued, the National Corps and their allies are still open to cooperation with Poles and deeply committed to the idea of Intermarium, as long as history is not used as a weapon against the other side. “History can never be a starting point for international relations, but every nation has the right to glorify its heroes in its own land,” the article read. The Lviv 2018 march was meant to be a radical demonstration of this position and a way to oppose the new Polish law that criminalises the denial of crimes committed by Ukrainian nationalists during the Second World War. The Polish side, however, saw the Shukhevych march as an unprovoked manifestation of anti-Polish sentiment. While Szturmowcy and Niklot did not take part in the anti-Ukrainian action at the Warsaw Embassy, both groups issued statements condemning the march. “We view the behaviour of the National Corps not only as openly anti-Polish and an outrageous defamation of our Polish national pride. It is also a blow to the past several years of our common work and fight,” Szturmowcy wrote. “In light of such a conduct and anti-Polish actions of the National Corps, further dialogue and cooperation are unfortunately impossible”. According to Jevgenij Bilonozhko, a lecturer in philosophy at the Kyiv University of Economics and editor of Polonews, after the recent events, past gestures of goodwill are unlikely to be repeated in the near future. “The Intermarium cooperation is, in fact, a secondary issue, as the main postulate of Ukrainian nationalists is defence of the country’s sovereignty,” he explains. At the same time, Bilonozhko notes, the National Corps remain deeply divided, with anti-Polish positions currently dominating the narrative. According to Bilonozhko, such views are seen as electorally attractive. While he admits that informal cooperation between Polish and Ukrainian nationalists will certainly continue, there will be no more joint photographs. Marek Wojnar from the Polish Academy of Sciences is also skeptical about the perspectives for further nationalist partnership in the current context. “There are several factors that hinder the cooperation. One of them is Ukraine’s memory policy glorifying OUN-UPA and the Polish martyrisation of the Volhynia massacre,” he explains. Divergent views on the common past and differences in historical memory may prove to be decisive in the failure of internationalist nationalism. For far-right groups, the nation remains the highest value and core identity, and this means that contentious stories and unhealed wounds from the past are even more likely to further divisions. This is nothing new. As Jean-Yves Camus explained, back in the 1930s, fascists backed by Mussolini tried to unite, but in the end the cooperation failed, as national interests prevailed over common goals. Similarly, Wojnar points out that close relations between Hungary’s far-right Jobbik party and Svoboda in Ukraine ended when, in 2011, the latter set fire to a monument in Ukraine’s Verecke Pass, which they saw as a symbol of Hungarian imperial power. The relations turned into open hostility and have remained so ever since. It is yet unclear how the new Polish memory law will affect the relations between the majority of Poles and Ukrainians outside the far-right bubble. For years, Poles have been the most-liked nation among Ukrainian citizens, many of whom live in Poland.